Most parents would agree that parenting is a challenging yet rewarding role. Millennials (born between 1980 and 2000) are quickly becoming the new parental majority, numbering 22 million with 9,000 babies born to them each day. They use social media in every facet of modern life: 90% of millennials are active on social networks (Steinmetz, 2018). The daily pressures that millennial parents, especially mothers, feel are profound. In a parenting report released by Baby Center, 80% of millennial mothers reported wanting to be the “perfect mom” (as cited in Steinmetz, 2018). Information on parenting is so easily available, millennials often know more about child development than generations before. Yet they report feeling confused about the right way to parent and more harshly judged by others for their parenting choices. In 2012, TIME reported on one of the most popular parenting strategies for this generation: attachment parenting. This parenting strategy emphasizes the bond between mother and child. A secure attachment is the foundation of health for children and adults in psychology research, but there is more to the model of attachment than what is depicted in our culture and Instagram posts with the hashtag #attachmentparenting (numbering 340,000 posts on Instagram). The founder of attachment theory in the psychological literature was John Bowlby, studying babies in orphanages that lacked any attachment to caregivers. Margaret Mahler furthered his research, studying mother and child relationships exclusively (Hamilton, 1990). She spent decades observing babies and their mothers in the first years of life and the development of this relationship. Mahler concluded that the first 6 months of a baby’s life is centered around a phase called symbiosis. According to her theory, this phase should include closeness between mother and baby. The mother’s primary focus is to respond to cries and meet her baby’s needs. This period is critical for children because having a secure base (their mother) is necessary in order to explore the world. 6-10 mos. Hatching: The child shows an interest in the outside world. A mother encourages exploration and is there, nonrejecting, when the baby turns back to mother to fulfill certain needs. 10-16 mos. Practicing: The child continues to explore their world, showing great interest in toys and other objects. They may crawl or creep away from the mother but check back at points in their exploration. A mother encourages this phase by delighting in her child’s new discoveries while being present when child wants to return to her. 16-24 mos. Rapprochement: The toddler is more aware now than ever of their separateness from the mother. While this phase involves further separation from the mother, there are also moments when the child needs to know that the mother is there. A mother can help a healthy completion of this phase by encouraging exploration and being nonrejecting when child comes back to her. Temper tantrums can be common in this phase as the child learns of their dependence on others to have certain needs met. This should be embraced with understanding rather than shame or punishment. 24-36 mos. Object Constancy: In this phase, the child is learning how to hold a positive image of their mother without her physically being there. This phase is open-ended and occurs throughout one’s life. As the child navigates through this phase, they are less concerned with the mother’s whereabouts because of their ability to hold a positive mental image of her in mind. A mother can help with this phase by being emotionally consistent. Engulfment: This occurs when a child is not encouraged to separate and individuate from the mother in early childhood. As an adult, the engulfed child becomes an adult obsessed with relationships, demanding others meet all their needs without taking responsibility for meeting their own needs. These children can also experience the fear of engulfment as adults. They can push others away when they feel they are too emotionally close, and they often fear repeating the same experiences that occurred in childhood. Enmeshment: This occurs when the child continues to experience the mother’s emotions as if they were their own. As an adult, they can develop unhealthy attachments to others, with a lack of respect for personal boundaries or the boundaries of others. 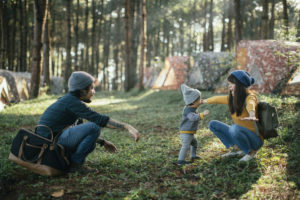 Insecure Attachment: When a mother puts her needs to connect with her baby above the baby’s need to become their own person, an insecure attachment can form. Specifically, babies who experience this can become afraid to express their needs because they know that mother will not meet them. They can also become hypersensitive to mother’s needs, knowing that they will have to meet her needs for her. For millennial parents who feel pressure to be perfect, the attachment literature can be encouraging. Theorists who embrace this model of attachment have coined the term “good enough mother” (Hamilton, 1990, p.52). The good enough mother responds to their babies needs consistently. Perfection is not something to be attained and should not be attempted. The emphasis is on maternal consistency in creating a secure base for the child, rather than solving all the child’s problems. In addition to the information on attachment, there is also research that can help new mothers in their parenting role. It has been stated that for millennial parents, “Google has become the new grandparent, the new neighbor, and the new nanny” (Feiler, 2017). Yet relying on the internet for parenting decisions can be extremely isolating and lead to maternal dissatisfaction, especially for young mothers. A recent study (Luther & Ciciolla, 2015) surveyed over 2,000 mothers to understand factors that contributed to maternal satisfaction. Two areas were consistently linked with maternal depression: 1) Feeling overwhelmed by responsibilities, and 2) Maternal guilt. When mothers scored high in the areas linked to maternal depression, but also scored high in the buffer areas of friendship support, they were more likely to score high on parenting satisfaction scales. The takeaway here: Having supportive friends is critical for the parenting journey. While Google can be helpful, it should not replace the connection and learning one receives from others. If you would like more information on attachment parenting or are seeking professional help for your parenting journey, you can contact a licensed therapist here. Hamilton, N. G. (1990) Self and others: Object relations theory in practice. New York, NY: Rowman and Littlefield Publishers, Inc.
Steinmetz, K. (2018, Aug 31). Help! My parents are millennials. In TIME: The science of families, (pp. 70-75). New York, NY: TIME.